Last week, I looked at relationships between sisters with my blog post and painting, “Wishes”. This week, I take a closer look at another relationship, mothers and daughters. I don’t have a daughter, but I am a daughter. My mother is still alive, in all her glorious 84 years! 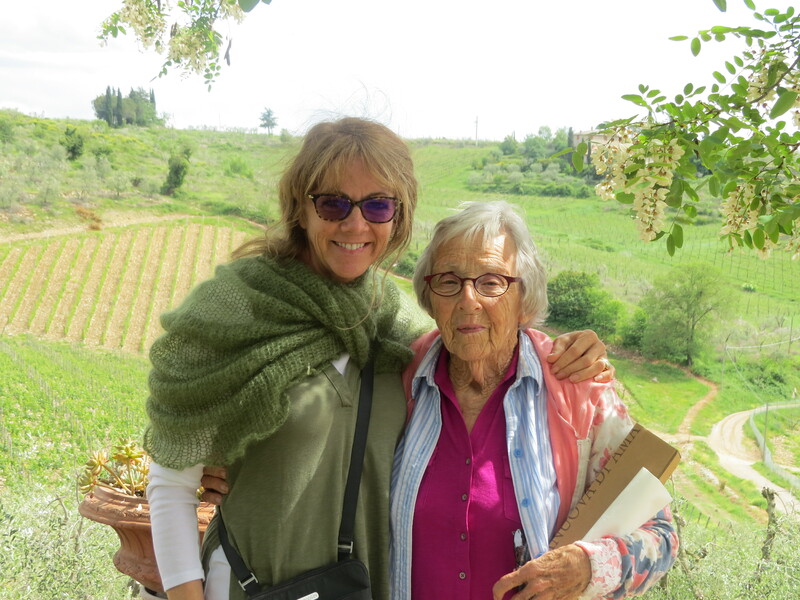 She went to Italy with me this spring, during our Paint Tuscany trip. My mom and I and my sister formed an interesting triangle growing up. I was caught mediating battles between two of them. Although unpleasant at the time, it taught me valuable skills of negotiation, compromise, and an ability to see both sides of every argument. After my sister left for college, Mom and I grew closer and enjoyed many activities and conversations together. Our relationship bloomed further after I married and started a family. Even though we lived 1,300 miles apart, we talked every week and saw each other as often as we could. Through the past 30 years, my mom and I continue to grow our relationship as she experiences the downfalls of true age and shares with me what it was like for her to go through her 40’s and 50’s and the challenges that each age brings. She has always been there for advice with parenting, marriage, and friendship. She gives me incredible encouragement and drive to go after my dreams of being an artist. She went to college and obtained a degree in her 50’s and has written and published 2 books. One of which she just published last year at age 84! During my childhood, there were many times when I believed she “didn’t love me”, didn’t understand my troubles, or just didn’t care. What I couldn’t grasp at the time, was how much she really did care, and sometimes that care resulted in actions just the opposite of what I wanted to happen! 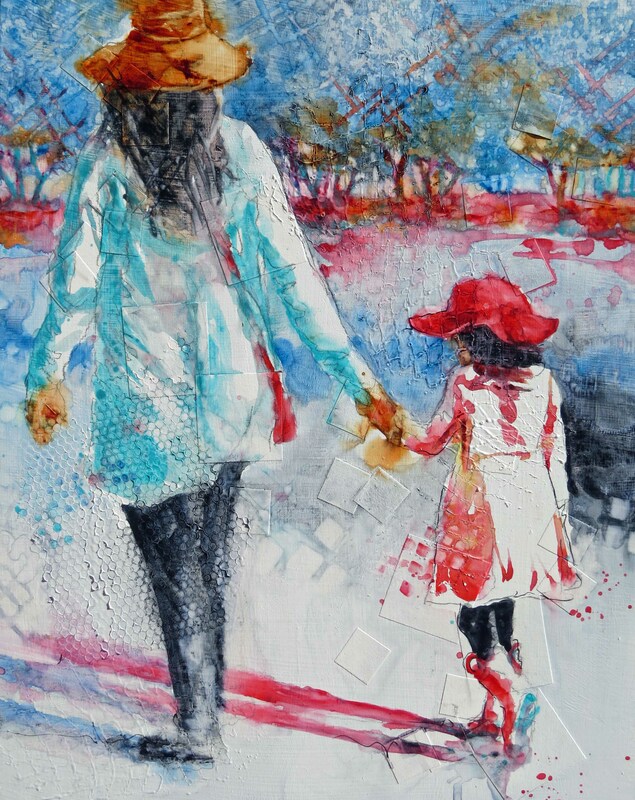 In painting “Going Home”, I wanted to capture a moment in a day when, after several attempts to rally her daughter, Mom finally grabs the daughter’s hand and says, “Yes, it is really time to go. Now.” It’s the end of a fun day and the daughter is tired and sad to leave. She feels her mom just doesn’t understand, or care about her feelings. The mother is tired as well, and both trudge off for dinner and possibly a bath before bedtime. Mom imposed her rule and her authority and daughter is feeling the brunt of it. But the mother has only the well being of her daughter in mind. In this painting, I bring up a conversation about the relationship between mother and daughter. They are joined at their hands and in their communing shadows on the ground. Although you can feel the disappointment in the daughter, there is acceptance in her posturing, and a love and connection both will feel their entire lives. The colors are joyful, promising a bright future. “Going Home” is available at Tumalo Art Company in Bend, Oregon. When you go to see it, notice the explosions of square colors radiating off the girl’s skirt. Her emotions cannot be contained. The shadows mingle and their hands are connected to illustrate the lifelong connection between the two. Trees are in the background, softly suggesting a promising future. Notice that the girl has rubber boots on. This brings up a conversation that morning about shoe wear. The mother probably didn’t want her daughter to wear the boots, but gave up on the argument, acknowledging her daughter’s ability to choose her clothes and giving her that choice., further illustrating the balance of authority, choices, friendship and love in their relationship. You are certainly welcome! Thank you!